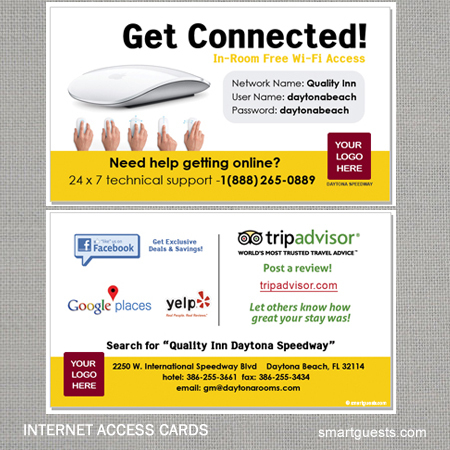 Make your hotel’s Internet access cards more hardworking. Apart from giving out your hotel’s Wi-Fi access information, our professionally made and beautifully designed Internet access cards encourage your hotel guests to rate their stay and give your hotel an online review. Complement this with a home page where that direct your guests to post a review about their stay at your hotel online. If you have any questions or special requests for your card, please email us. 4) We Priint and Ship! Turnaround time is usually 4-6 business days See more delivery options.